While fans everywhere line up for tonight’s opening of “The Twilight saga: Breaking Dawn, Part 2,” the fifth and final movie in based on Stephenie Meyer’s vampire tale, supporters of a local nonprofit agency that places abused, abandoned and neglected babies in foster homes already know how the end of the story looks on the big screen. Hundreds of Twi-hards purchased advance tickets for a benefit screening of the Summit Entertainment movie at the Arlington Theatre on Wednesday night, with proceeds going to Angels Foster Care of Santa Barbara. Founded in 2005 by Meichelle Arntz, Angels Foster Care focuses primarily on children 2 and under (and siblings as old as 5) who are entering foster care for the first time. “We take 20 new babies a year, and are caring for 50 a year now,” Ms. Arntz told the News-Press. For all of the “Twilight” films, the foster family agency was able to hold a pre-release screening as a fundraiser thanks to Robert Friedman, co-chairman and CEO of Summit, which early this year was purchased for a reported $412.5 million by Lions Gate Entertainment Corp. Mr. Friedman is a friend of Angels board member Lynda Elton and her husband, Byron. Wednesday’s event featured general admission tickets for $25, and a VIP party in the theater courtyard and preferred seating inside for $100. Everything went as planned – and the fans had a great time. An estimated 520 fans waited in the general admission line that ran out to State Street and down the block. Aeron Torres, 30, near the front of the line, has been following the series since the first book. “I only wait in line for special movies,” he said. Sophia and Julie Fay, 12-year-old twins and both members of Team Jacob because Edward is “too pale” were at the VIP party. “So cool that I get to go to this,” Sophia said. The girls have been fans since the first movie, although they admit they haven’t read the books because their mom wouldn’t let them, and are unsure how it will end. “A happy ending,” Julia added. Ms. Arntz, who patterned Angels after a foster care network in San Diego, said the final fundraiser in the “Twilight” film series was bittersweet. “It’s our last one and we’re sad. We just feel so lucky that we had such generous people supporting us,” she said. Based on the four books by Ms. Meyer, what began in 2008 with a little movie (“Twilight’) about a vampire and a teenage girl who fall in love and featuring a cast of relative unknowns, has grown into a five-movie franchise with a two-part ending that has a worldwide following. In the run-up to Wednesday’s event, Ms. Arntz reflected on how things have changed since that first benefit screening. 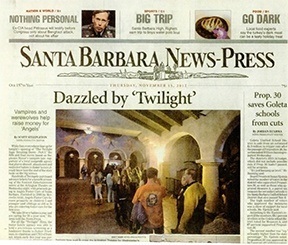 The first event, coinciding with the release of “Twilight,” was in a theater that held just 250 people. It was a sell-out. With every new installment since, “The Twilight Saga: New Moon” in 2009, “The Twilight Saga: Eclipse” in 2010, “The Twilight Saga: Breaking Dawn, Part 1” in 2011 and now “Breaking Dawn: Part 2,” the crowd was at least double the first event’s. Growth meant a change in venue. The events have featured “Twilight” merchandise giveaways, themed treats, “wolf” cameos and other activities suited to fans. And starting the second year, “Angels families” – those who are going through or have gone through Ms. Arntz’s agency – have been pulled from the general admission line and admitted to the VIP party. And oh, what nights they’ve been.